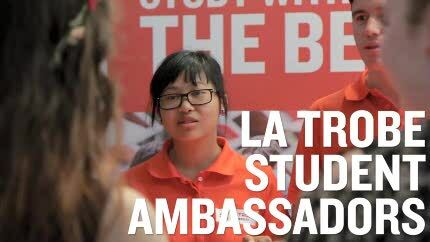 Our student ambassadors are high achievers, leaders among their peers, enthusiastic and passionate about La Trobe University. They're friendly, approachable and always willing to share their story and experiences. They're genuinely committed to helping future students reach their own career goals. 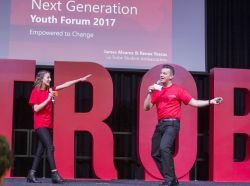 Working within the Marketing and Recruitment division, student ambassadors help recruit new students and promote La Trobe University. 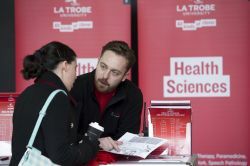 They represent La Trobe at career expos, visit secondary schools and conduct our campus tour program. They are the face of La Trobe and possess a working knowledge of their study area, campus and the facilities available to students. All student ambassadors receive comprehensive training to develop their public speaking, communication, team participation and organisational skills. Further leadership and professional development opportunities are also available ad hoc. Receive personal and professional development in an encouraging and challenging environment. Become part of a diverse and motivated team. Work with students from all areas of the University. Enjoy social and academic networking opportunities with fellow students and staff. Be rewarded for sharing your experiences. During the final quarter of the year, the Sales and Customer Experience team begins a process of employing student ambassadors from different study areas and backgrounds. If you're interested in applying, please express your interest via ambassador@latrobe.edu.au.